Since starting this blog I've been purchasing a fair few new products in the name of research, and i've come across a few really great drug-store gems. Funnily enough, they have all been by Bourjois - a brand I had heard of but had never bought anything from before moving to the UK. I must say, for the price and quality, I am impressed. My first little buy was the Healthy Mix Serum Foundation in 52 Vanilla which a lot of other bloggers had recommended, and they were right. It is a lovely light-weight foundation with the perfect amount of coverage for only £9.99 for 30ml. While I will always love my foundations by Chantecaille and YSL, this is a great additional product to have for those more low-key days when you don't want to use all your very best makeup. The bottle is quite sleek and small with a pump-action dispenser so it is a goodie for travel. The day I went in, Superdrug had a 3 for 2 deal going on, so as well as the foundation I also picked up the matching Healthy Mix concealer in medium (£7.99) which I have been using the death and one of their new Colour Boost Lip Crayon in Fucshia Libra (£7.99). The concealer works well for under my eyes. It is very sheer and an easy option that you can apply with your finger without having to mess around with a brush. I do like the lip crayon, it gives an intense glossy colour however they only have 4 colour options and none of them are a perfect choice for me so I don't think I will be repurchasing this. 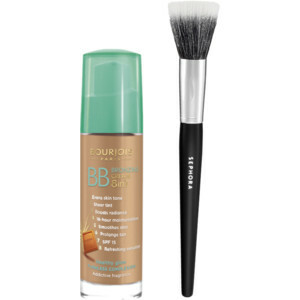 The latest Bourjois product I have tried is their BB Bronzing Cream (£6.99) which claims to have an 'addictive fragrance' .... I was intrigued. I must say, when I first pumped out some of the product on to my hand I was a little concerned. It seemed pretty dark for my very white skin. I was pleasantly surprised once I had buffed it into my skin properly using a stipple brush in a circular motion. It does give a lovely wash of colour to the face. I think it is something I will only be able to pull off in the height of summer or when i'm on holidays as my face just isn't that tanned on an average day in London, but this is a little gem to have in the cupboard for when you need a holiday skin look at a bargain price. As for the addictive fragrance, I think the whole bronzing range is supposed to smell like chocolate. For me it had a pleasant smell but not good enough to become addicted to. Are there any other Bourjois products I should try? If you have a favourite mention it below in the comments box!